Affiliate marketing, popular since the early days of marketing, helps you receive a commission or referral amount when recommend a product or service to someone and the individual end up purchasing that from the merchant site. Affiliate marketing is a good way to judge how well your digital marketing efforts are working. It is also a great passive source of income that doesn’t require round-the-clock attention and can even generate income while you’re sleeping. There are number of resources available online to get information and learn the tricks of the trade. However, getting a training course and learn the trade secrets, add skills to your resume and become more confident as the learning curve can be very steep on your own. 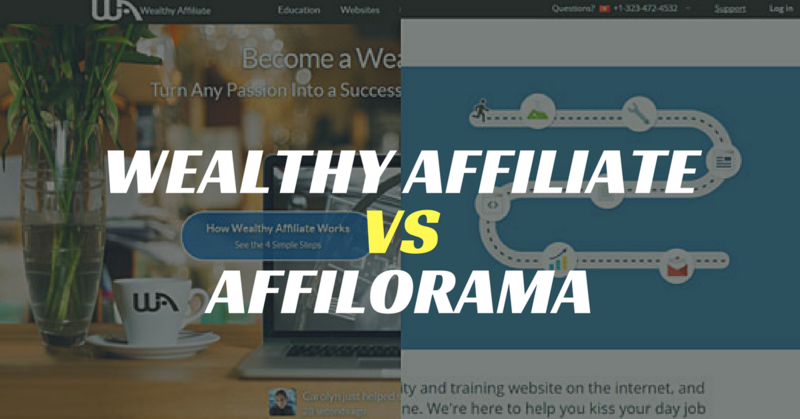 Wealthy Affiliate and Affilorama are the two largest affiliate marketing training courses. Both are legit training programs taken by thousands of individuals all over the world. It does not promise overnight success but guarantees to empower you with all the knowledge required to setup a successful online business. If you are confused which one is the perfect affiliate training course for you, reading this article will give you a fair idea about the two and give you an unbiased view of the two. Wealthy Affiliate was founded in 2005 by Kyle & Carson, has gradually advanced into the big training platform today. There is a wide range of training content available, both free and paid, making it a source of knowledge specially for the novices. Affilorama was founded in 2006 by Mark Ling and Simon Slade with the key focus on teaching people new ways to affiliate marketing and how to prosper an online business. They too have abundant reading for free as well as paid membership options. More than 120 step-by-step video, text and live webinar training sessions, for starting your business and growing it over time. How to earn a commission when a product is sold through your referral. # 91 step-by-step videos and tutorials to guide you through each level to understand affiliate marketing. #Active private members’ forum for advice and extra tips. #AffiloTheme website builder included as a bonus. It goes with you through set up of your website with easy customization. #Here you can expect to learn all about keyword, market research, writing content, building a website, web design, SEO and more. AFFILIOJETPACK is another course for professionals offering a complete package, but its currently not available. Overall, Wealthy Affiliate follows a more systematic and continuous approach of learning with its affiliate marketing courses. The big library of training, tools, features and overwhelming response on online queries makes it a favourable choice. There is no money back in this course. Free membership too gives you access to the big world of info. Additionally, you can try the premium membership for just $19, but only for the first month. Affilojetpack program ($497) – “Done for you” website kit with pre-written articles, emails, etc. Affilotheme ($97) – A WordPress theme designed for affiliate. Affilorama offers a 60 day money back guarantee in each of the programs. Affilioblueprint is a complete product and can be availed without being a premium member at Affilorama. Priced at $197, it is a good value for money. But before going premium, you should try the free membership, that has too much to offer. With live trainings and seminars, there is knowledge addition every day, not just be trainers but by active members as well. We feel the premium membership of Wealthy Affiliate program really over perform in terms of volume and quality. This is a rare feature of internet marketing world. Nonetheless, Affilorama has abundant free content and easy to go style. Although in Affilorama, the premium membership can be made better. They should offer more to premium members, if they wish to complete with other top class affiliate marketing training platforms available. Kyle and Carson are also continuous upgrading Wealthy Affiliate and it has transformed a lot. If you really want to try both the platforms, you can start Affilorama for $1 with 30 day trial pack and sign up to Wealthy Affiliate for free. While there are differences in the support system for both, each one is doing a good job of it. The key difference is that Wealthy Affiliate offers 24/7 live support while Affilorama caters to ticketing system. At WA there is a live chat feature, so you can ask questions anytime, however, with lots of new members joining, you may receive incorrect advice at times. The web support can also be contacted anytime for any technical issue, who are fantastically quick. You can even contact one of the owners, as both of them are available on live chat. This 1 on 1 information gives you a personal comfort. But there is an issue, you may get distracted by the continuous community chat, and end up wasting your work time. The email support at Affilorama is very helpful, but they may take a day or two to respond. You can also reach the community members, but with so many members, you may not get the correct information every time. Also once you subscribe, you start getting emails by Mark Ling trying to sell other products, which may not be of your interest. Personally I feel it’s an added advantage if you can get help just when you need. Also the community vibe in Affilorama is not the same as at Wealthy Affiliate. Wealthy Affiliate offers more support with more active community engagement, more web hosting, more than 10,000s trainings, 24 by 7 live chat and more useful tools as compared to Affilorama. It is a platform for those who want a real learning of the subject and wish to do at their own pace and time. The only thing that counts more in Affilorma are the Affiliotools; but to be really honest, they are more in number but less in use. There is another important question, which one is easier? Answer is Affilorama. Here you can just buy the set up without knowing affiliate marketing in detail and get going. Affilorama has a lot of potential, but lack in fundamentals and relevancy. On the other hand, Wealthy Affiliate never stops innovating and getting better over the years. Overall, we found that Wealthy Affiliate is better value for money. It is substantially cheaper in spite of the abundance of information and has a more active web community. Both the courses focus on teaching affiliate marketing, their styles and methods are quite different and on that basis alone, you have to decide which one to go for. Wealthy Affiliate gives you skill training and show you methods that can be used to achieve the goals. Whereas, Affilorama shows you training style to create a niche site. Here you can make your life easy by opting for package where things come ready. Comparing the key areas, Wealthy Affiliate is a clear winner in all aspects. However, what works for one, might not work for others as it all depends on your preference and style. Both the courses are rich enough to educate you on the basics as well as advanced techniques of affiliate marketing and take a big leap.